Someone once said that a marriage is made of two people giving 50% of themselves. Well, I would like to say that is close but it is not enough. A marriage is made of two people but that is where the similarities end. For a marriage to reach its full potential, it has to have both parties giving all of themselves…not just half. If either of the parties are only giving half, where is the other half going? 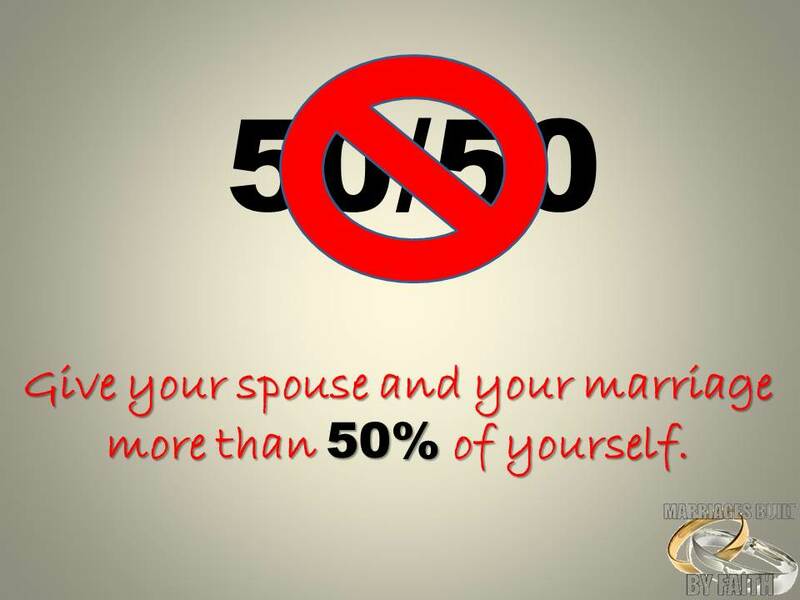 If I am only giving 50% to the marriage, I am putting unnecessary weight on my wife; which in turn stresses her out and creates a host of other issues within the marriage and family. Let us do an evaluation of our participation and effort to the marriage relationship. Let’s take note of whether we are giving all or only part of ourselves. Our marriages deserve our very best every day. Let us remember…No More 50/50. That’s so true, I’ve never thought of that statement like that before! Thank you! Keep checking in! Awesome blog on marriage. Marriage is about giving your all to your spouse not just part of your self. Amen! Thanks for re-blogging this post…I appreciate it! Blessings! I agree with the lesson but not the arithmetic. Marriage is a whole = 100%. If I give all I can it is only my part = 50% and when my wife does the same her 50% and mine = 100%. But when this is viewed, not as the relationship, but each separate individual’s activity the relationship is cut in half = 50%. If an individual gives only 50% of what they could, that is half of a half = 25%. I know, the whole thing gets confusing, I’m only half serious and in my quarter of the world we make the 100% together like music from a Divine DJ. Since I’m a halfwit how does that affect the math? Your wife and mines as well! 🙂 Your arithmetic is correct in this matter. Serious or not, it absolutely must be both parties giving ALL of themselves for a relationship to have any chance of real success. Good advice not only for marriage but for any relationship.